Heads roll when people can't compete, changes are made when problems are obvious. Losing is a problem, but the root of that issue can be hard to define. 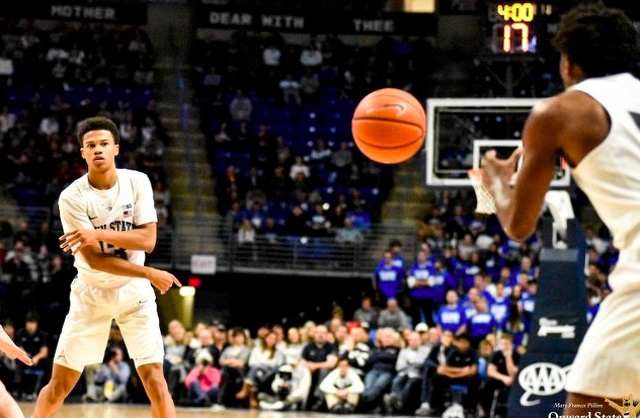 It's a thought that races through your head as you watch Rasir Bolton -unguarded- miss a shot from under the basket with 19 seconds to play, the Nittany Lions down by two. Not long before, Lamar Stevens milliseconds from doing the same, but the shot clocked expired. In turn Ohio State would go on to win 74-70 in Columbus, Penn State coming up short of a fourth straight win against the Buckeyes, a program it has only beaten on 18 occasions in 56 meetings. This time there was no Tony Carr and a forgiving backboard to save the day. And maybe it's that simple. Penn State doesn't really have a point guard and is now without an all-time great and a prolific three-point shooter in Shep Garner. If a well equipped football program can struggle following mass departures of key players, why wouldn't the basketball program, one far less prepared for such vacancies. In the end you get eight losses in conference play by single-digits, almost all of them two baskets. It's seven points, two points, six points, seven points, one point, four points, nine points in overtime and four points on Thursday night. All of them competitive games, all of them winnable. Most of them decided late. None of this is to say Penn State should accept losing, or operate under the assumption that God really does hate the program, good teams create their own luck or play well enough to avoid letting the bad breaks determine the game. You do that by finding and developing better players, when you coach better, when you demand more and continue to invest. Even so, Ohio State is paying Chris Holtmann (more or less) three-times what Penn State is paying Pat Chambers and it wasn't coaching that decided Thursday night's game. Penn State Football: Just How Far Does James Franklin’s Loyalty Extend? James Franklin’s players know this line. It’s from rapper Kendrick Lamar’s hit of the same name, which has been viewed on YouTube more than 167 million times.